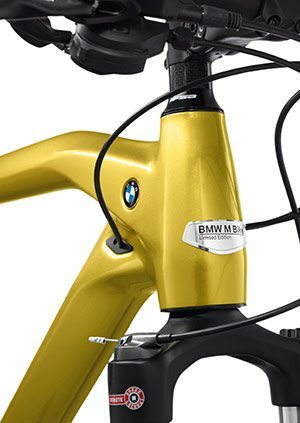 BMW is complimenting its bicycle collection in spring 2015 with the presentation of a colorful tribute to the BMW M automobiles: a limited special edition BMW Cruise M-Bike. The characteristic Austin Yellow Metallic of the BMW M GmbH was adapted for this edition, which has been limited to 500 exemplars. Each model of the limited edition comes with a specially made plaque and a certificate. The BMW Cruise M-Bike stands out with its modern design and lightweight construction elements. An optical highlight is the so-called “Bullneck” on the top tube in the front frame, which was borrowed from motorcycle design and is reminiscent of the tank position. Its hydro-formed aluminum frame and carbon components make the BMW Cruise M-Bike both light and stable. Despite its low weight, the frame is very rigid, which ensures maximum power transmission at the lowest possible effort. The ergonomic handlebar concept, which is individually adjustable, allows for a comfortable ride, while the hydraulic disc brakes from Shimano guarantee a safe arrival. The BMW Cruise M-Bike combines a striking colour concept inspired by the BMW M series and high-quality technical components. The hydro-formed frame and carbon elements, which make the bicycle light and strong at the same time, together ensure a unique riding feel. Additional comfort is provided by the stabilising handlebar concept and the front-sprung fork with locking system. The hydraulic disc brakes from Shimano enable precise braking even on long descents and in any weather situation. Brakes are manufactured according to EU specifications. For UK, the brake cables must be changed by a specialist (hydraulic brakes). The current bicycle collection stands for versatility and quality. For children and adolescents, two suitable models are available: the BMW Kids Bike and the BMW Cruise Bike Junior. For lovers of difficult terrain, the BMW All Mountain Bike is the perfect companion. For rides in the city, the BMW Cruise Bike, with its symbiotic interaction between dynamics and functionality, has its advantages. A sporty alternative is The BMW Trekking Bike with its hub dynamo, sturdy luggage rack, and integrated bicycle pump. In addition to the different bicycle models, the BMW bicycle collection offers matching equipment such as helmets, water bottles, bicycle locks, or a practical bike backpack.